America's transportation needs. Photo by Linda Stewart. Sierra Club believes we need a transportation system that breaks our addiction to oil while creating jobs by providing transportation choices to all Americans. Oil dependence and lack of transportation choices has a profound impact on the well-being of American families and the economy. Nowhere is this truer than in Central Florida, with America’s highest percentage of family earnings spent on transportation needs. Sierra Club organizer Marti Daltry delivered written comments to Rep. Mica’s staff from 872 Sierra Club Florida members. Their message: America needs a transportation system that ends our dependence on oil, cuts pollution, and provides clean, efficient, and affordable transportation options while putting the country back to work. Talk about these goals were completely missing from testimony heard at Monday’s Florida Field Hearing held in Maitland by the U.S. House Committee on Transportation and Infrastructure, chaired by Congressman John Mica (R-Winter Park) with 4 fellow committee members present, including Rep. Corrine Brown (D-Jacksonville) and Rep. Nick Rahall (D-WV). Previous public hearings were held in West Virginia, Ohio, Indiana, Illinois, Oregon, California, Arkansas and Tennessee to inform the House Committee's work on the transportation reauthorization bill. ﻿﻿﻿﻿Rep. Brown was quite vocal in her support of high speed rail, taking FDOT to task for failing to distribute its recent report projecting 1st year profits of over $10 million from high speed rail from Orlando to Tampa, using the old Sgt. Joe Friday motto from Dragnet: "The facts, ma'am, just the facts". Other than her lament for Florida’s lost jobs, there was little talk by the committee panel or witnesses about this urgent, key reason for federal investment in transportation alternatives. 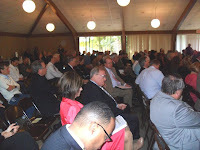 The event was well attended by the public and several local elected officials (mayors, commissioners, city council members) representing Orlando area municipalities. The committee’s invited witnesses represented Volusia County, FDOT, FL Transportation Builders Assoc., Palm Beach MPO, law firm Nossaman LLP, U.S.-Japan High-Speed Rail, and the transportation disadvantaged community. These witnesses' concerns focused on an uncertain revenue stream and the need for a streamlined permitting process for new highway projects. FDOT Asst. Secretary Ananth Prasad testified that in tough times no federal money should be spent on highway landscaping, sidewalks and bike facilities, a position supported by Bob Burleson of the Transportation Builders Association, and one we’re sure our bicycle and pedestrian group coalition members will find most distressing. Burleson also supported eliminating all transit funding from the highway trust fund, saying it should instead come from the general fund (where it could be subject to the level of budget cuts being experienced by a wide range of programs), and called for a change by 2020 from the gas tax to one based on vehicle miles traveled, as more efficient cars and trucks contribute lower taxes while creating the same need for road repair as low mileage gas guzzlers. Today's gas tax ($.184/gal) has not been increased since 1993, making it effectively $.13 in today's dollars. No mention was made of negative environmental impacts on Florida's residents if more roads are built, nor of any of the numerous environmental and economic benefits of developing transportation alternatives. Instead there were calls for further privatization of roads to allow construction (regardless of demand). Former Orange County Commissioner Linda Stewart, originally slated to testify on environmental concerns at the invitation of Rep. Brown, was deleted from the panel by Rep. Mica and was not permitted to speak during the hearing despite a plea from Rep. Brown that she be heard. According to Mr. Puhek, “Orlando is one of the most pedestrian unfriendly cities in the nation primarily because it designs intersections to move cars, not people. Use of roundabouts has proven in other cities around the world to reduce automobile accidents by 80% while reducing the amount of lanes that must be crossed by pedestrians." Rep. Mica said that written comments would continue to be received for the next two weeks. If you have not already done so, please send your comment on America & Florida’s transportation needs to marti.daltry@sierraclub.org - she’ll forward them to the U.S. House Committee on Transportation & Infrastructure. The Sierra Club was quoted in this Orlando TV news story. Tuesday Rep. Mica & DOT Sec. LaHood spoke to the American Public Transportation Association. More Drilling in the Gulf?